Ceremonial Tools with Soul! Each item is as unique as the person using them. 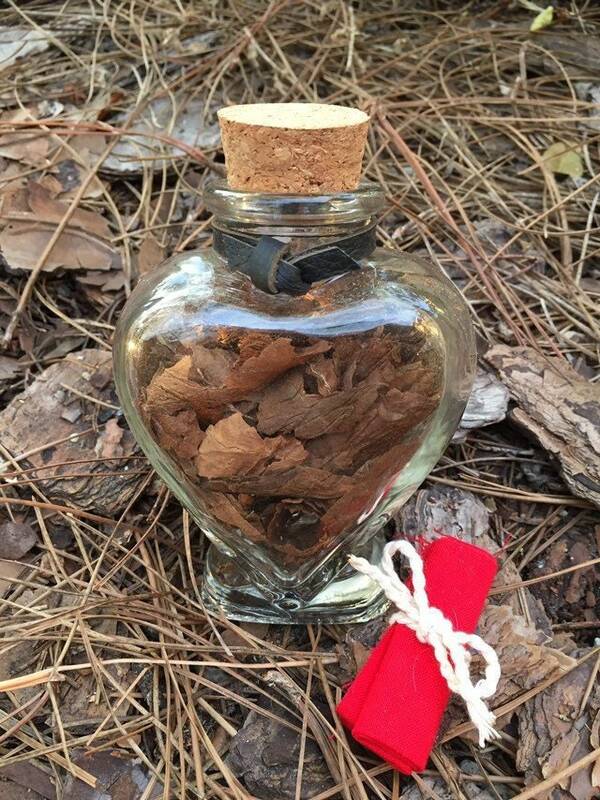 Heart shaped leather trimmed, refillable glass bottle holds your sacred tobacco herbs. Includes a red cloth tobacco prayer tie. 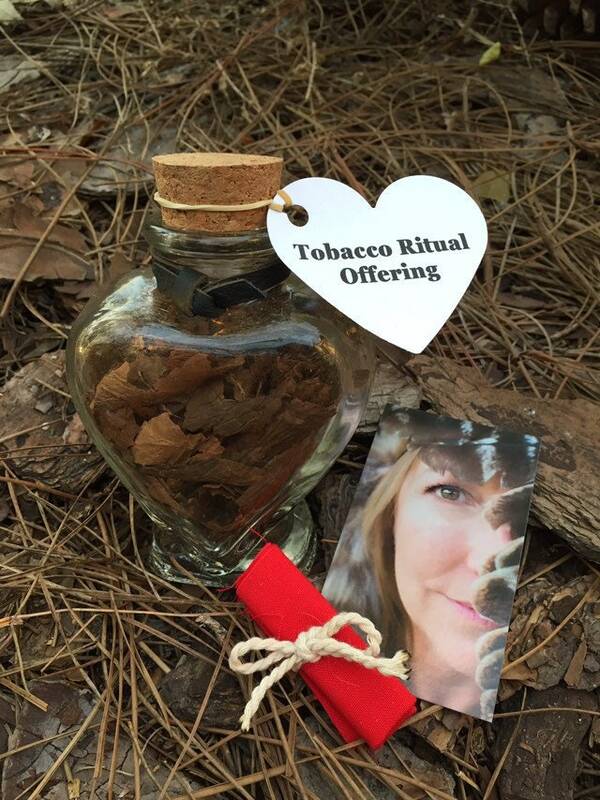 Our Tobacco Offering Kit is used as a spiritual medicine when presented in prayer as an offering. The Cherokee believed that "helper spirits' carried our prayers to the Creator when tobacco was offered in prayer ceremonies. It is a potent tool for working with the dead and is considered very sacred. There are many ways to use tobacco as an offering. Tobacco is often used at ceremonies marking life transitions such as births, puberty, weddings, funerals, and memorials. Tobacco is also used to ask permission or to give thanks for harvesting a resource. For example, tobacco is offered when taking anything from the earth, when hunting, fishing, harvesting plants for food or medicines etc. Often people will “put tobacco out” when they pass a dead animal on the road to honor that animal’s spirit. To use tobacco, place a small amount of tobacco in your left hand while praying and offering it up to the Creator. It can then be left at the base of a tree as an offering to Mother Earth or used as a fire offering. The smoke is believed to carry our prayers to the Creator. A tobacco tie is a small amount of tobacco wrapped in cloth and tied around the top. These tobacco ties represent ones prayers. Several can be tied to each other as a connected community/family prayer offering. When you make a prayer tie, place a small bundle of tobacco at the center of a square piece of cloth. Fold it up as you make your prayer “capturing it” within the bundle. Then tie the bundle with a piece of string or thin cloth. Within the Lakota and Cherokee cultures, a white cloth is used for a prayer for healing, a red cloth is used for our ancestors and a yellow cloth is used for giving thanks. Blue and green cloth can also be used. They can be tied on a tree branch out in an isolated place that has special meaning or in the home in places where prayers are needed; then taken down later, often four or five days. Then the tobacco ties can be burned with sage, which takes the prayers in the smoke to tonkasilas (grandparents). This item is for spiritual/ritual purposes only. Do not ingest! As with all smudges, sacred incense resins, herbs & wood, exercise caution when lighting and burning. Always use a heat proof container that is placed on a nonflammable surface and always keep away from children, pets and flammable items. By purchasing this product, you signify that you understand this responsibility. Love and Light Gifts is not liable for any injury, damage or loss resulting from the use of any and all products we offer. Information contained in this shop is for educational purposes only.